Wanna learn how to hack SnapChat fast, easy and most importantly without anyone knowing? Do you want to learn how to spy SnapChat Secretly and Remotely? Don’t worry SnapChat is just an app which can easily be hacked and spied just like and any other app. You are on the Mobile Spying site so as you probably suspect you will learn how to hack someones SnapChat Account on iPhone and Android. How to spy SnapChat secretly and remotely? Is there a way to hack someones SnapChat on iPhone and Android? Which one is the best SnapChat hack and spy tool? Can I download SnapChat hack and spy tool for free? So to answer my users on this questions I create this how to hack SnapChat article. Here I will answer you on this questions. Hope you will enjoy the reading. Ok, let’s see how to hack SnapChat? Are you here to learn how to hack SnapChat account and secretly view someones private SnapChat Data remotely? I bet you do and that is why I wanted to show you amazing Snapchat hack and spy tools that will allow you to hack and spy on someones Snapchat activities on iPhone and Android. These are tracking apps which were present on the Internet for a long time. As you probably know this communication platform is very popular and owners of the SnapChat hack and spy tools works hard to allow you spying on all account owner activities. Does this sound logical to you? However, these Mobile Spying apps are professional tools and allow you to spy on many other secret iPhone and Android activities. Every app has different features list so I recommend you to see Reviews article for detailed information. Ok, now you learn the answer on the how to hack SnapChat question. You will need SnapChat hack and spy tool and in just a few second you will learn: Which one is the best SnapChat hack and Spy tool? I say that every hacking tool has its advantage. However, I try all of them and want to present you the one that provides me the Best SnapChat hack and spy abilities. The tool that provides me the best hack and also spy abilities were Highster Mobile. This app will allow you to bypass someones SnapChat account password and spy on all its activities remotely and secretly. Does this sound good to you? Ok, let’s see how to hack SnapChat with Highster Mobile. The Highster Mobile Spy tool provide me the best abilities to hack and spy SnapChat on the target iPhone and Android device. It has many advantages and I think you will love this tool as well. These features satisfy my need and also the Highster Mobile Spy has the lowest price. If you ask me this hack tool is perfect for communication platforms spying. Don’t you agree? Does this sound good to you? So Highster Mobile allows you to spy on someone’s social media and IM chat activities as well as other activities like calls, GPS locations and much more. You can see the full feature list on the Highster Mobile reviews article. So do you like Highster Mobile Hack and Spy tool? …Android and iPhone devices. Right now mSpy is one of the world best monitoring apps but it can also be used to hack and monitor SnapChat activities secretly and remotely. mSpy is the monitoring app but this means that you need to have the real-time full view in someones iPhone and Android activities so you can prevent unwanted situations. Do you want real-time full control owner someones activities? This means that this app also allows you to monitor other mobile phone activities as well. That is the main reason why I point out mSpy hack and monitor tool. If you choose to monitor on other mobile phone activities than mSpy is the ultimate hacking tool which you should look closely at the mSpy reviews article. Don’t you agree? ….activities secretly and remotely. However, the Spyera hack tool costs much more than Highster Mobile and mSpy. So you probably ask yourself now why did I point out Spyera as the top #3 Snapchat Hack and Spy tool? It is because of one feature called Spyera Password cracker which will allow you to hack Snapchat Password and secretly login to someones account without them knowing. How to Hack SnapChat Password? …and all other accounts passwords. So do you want the ability to hack someone account password without them knowing and secretly login to the account for yourself? If so then you should definitely need to consider of using Spyera hack and spy tool. However, if you ask me the price is higher and Highster Mobile and mSpy also allow you to secretly bypass the account password and spy on its activities remotely. For me, this ability is enough and I recommend you to use Hightser Mobile. However, if you choose mSpy or Spyera instead you will not regret it. So which one SnapChat hack tool best suits your needs? Final Conclusion on How to Hack SnapChat Account with The Best Hacking Tools? …and cheaper than any other solution that is provided to you on the market. So if you are looking for the most cost efficient hack tool which will do the job then I recommend you to use Highster Mobile Spy. On the other hand, mSpy is the ultimate solution for iPhone and Android monitoring and will provide you many other abilities. The last tool is Spyera. The Spyera is the best SnapChat hack and spy app but t cost more. Spyera will allow you to hack SnapChat password and log into someones private SnapChat account for yourself. However, if you ask me the price is too high so I recommend you to use solutions that only bypass account password and extract all Snap activities secretly and remotely like Highster Mobile Spy. How Can I See Extracted Data Remotely? These two requirements are provided to you with the purchase. So once you purchase Highster Mobile, mSpy or Spyera you need to setup the app and once you do that all extracted data will be visible to you remotely on your online account. …and etc. Once you login to the online account you will be provided with the user-friendly navigation so you can easily see all extracted data. However, once I extract the snaps from tracked SnapChat account I was able to view snaps whenever I want for as long as I want. Pretty cool, do you agree? Can I Remote Take and Save Snap Data on Computer or Laptop? How to take SnapChat Screen? Above in the „How to spy SnapChat?“ part you could see that all activities are taken remote from target Android or iPhone. Then the taken activities are uploaded to your online account where you can see it. Once you save Snap data there will be no way that you lose this data. On the other hand, there is the option to take SnapChat screen. How to take SnapChat Screen remotely without anyone knowing? To take someone Snap screen I suggest you use Spyera hack tool. As you could learn above Spyera will take the target account password and allow you to log into someones account remotely whenever you want. Once you login to someone Snap account there is no stopping you from doing whatever you want. If you want to take SnapChat screen then you can use PrintScreen option. This two buttons should result with screen take. Once you print screen someones account screen it will be saved in your gallery where you can see it whenever you want. Nice option, right? How to Download SnapChat App? 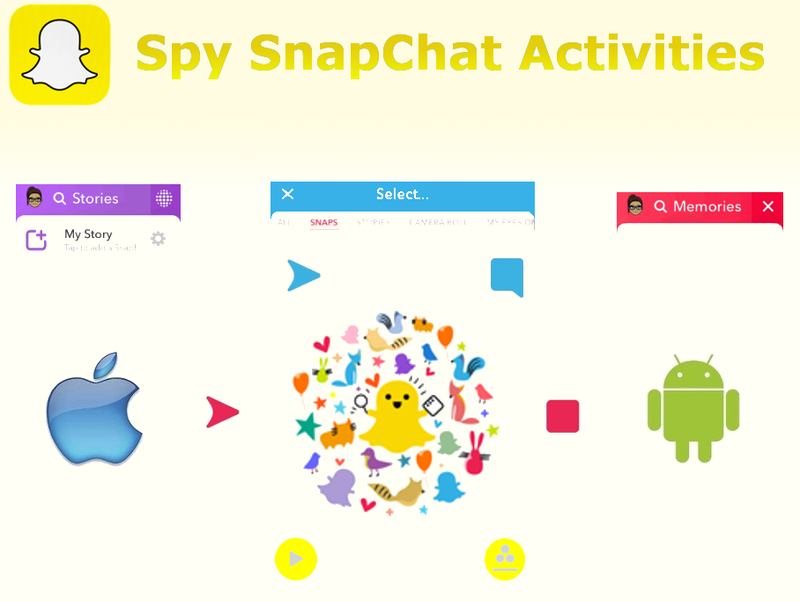 Is there Way to Spy Snap Activities Free? Downloading of the Snap spy app is the trivial process. The fastest and easiest way to download any app is just to simply insert the download link in the mobile phone web browser. Right? …download link and insert it into the phone web browser. In the install articles, I provide you download links for every app. However, once you download the app you need to activate it. For the activation, you will need to have the license key. Is there the way to Spy Snap Activities Free? Here in the how to hack SnapChat Account article I want to note that you can’t find Mobile Spying app which will allow you to spy Snap activities for free. That is reasonable because this is professional monitoring app and these apps cost money. Does this sound logical to you? …but note that this is scam apps which will not do the job. The Mobile Spying apps that I show you are used by many users all around the world because they actually work. So do not believe in the free solutions. How to Hack and Spy SnapChat on iPhone and Android? The major question that you can ask yourself is: How to hack and spy SnapChat on iPhone and Android? This app can be used to simply hack and spy SnapChat on iPhone and Android secretly and remotely. All apps possess invisible mode features which allow them to stay invisible and remotely spy on someones account data without them knowing. Once the app is setup it will immediately start spy on someones iPhone and Android device activities and the only thing you need to do is to simply log in to your online account and view all private Snap data for yourself. So do you wanna see someones Snap data remotely from your online account without them knowing? Every app has some advantages and disadvantages. However, I tested all the apps and the Highster Mobile provide me the best hacking and spying options. Because of that, I recommend Highster Mobile hack tool if you wanna hack and spy on someones SnapChat Activities secretly.